Services 2nd Sunday of each month 10:30 a.m. Elder Robert Webb, pastor. One mile south of Iola, across from the Old Settlers Park. Crooked Creek Church was organized in April 1828, by zealous pioneers who were newly settling in the area. 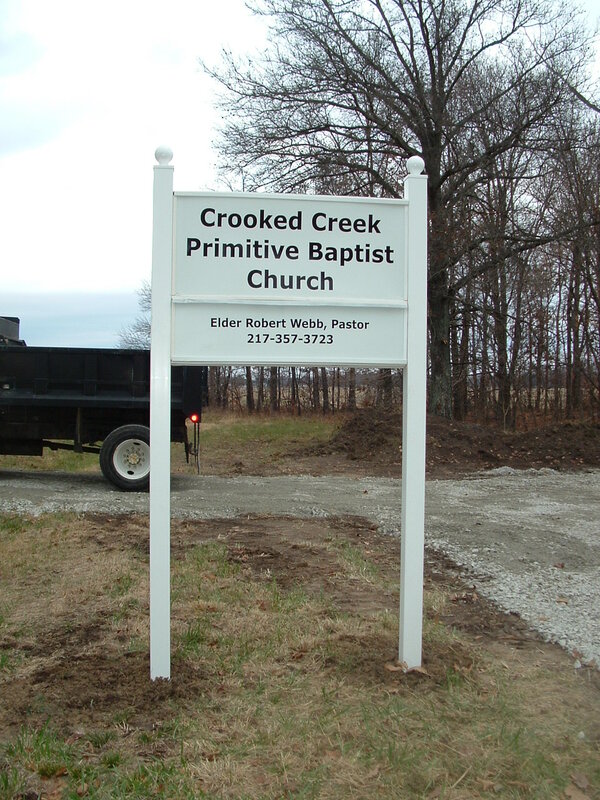 The first meeting house of Crooked Creek Church was a log structure, erected at the site of what is now known as the "Old Baptist Cemetery." It was used until destroyed by fire. In 1864, a building was erected at the present site, in what was called the "Hickory Grove," about one mile south of Iola, Illinois. A few pews, and a cabinet, from this building, have survived, some of which have been refinished and are being used in the new building. A larger frame building was erected at the same site, in 1904-1905, which stood until it was demolished and burned on December 3, 2010. The slat pews, wainscoating, chairrail, woodwork around doors and windows, the pulpit platform and arch boards, the pulpit itself, and other salvageable materials were removed, and refinished, and they now look beautiful in the new building. Crooked Creek Church was prospering 100 years ago. 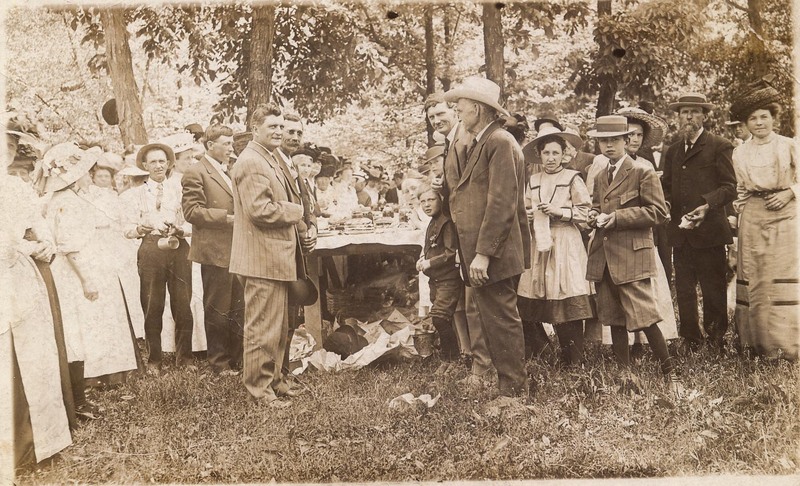 This photo was taken in May 1911 - "dinner on the grounds" - a tradition which may have been the forerunner of the Old Settlers Reunion across the road. Seated, left to right: Paul Jones and Arthur Young. Standing, left to right: Elder Elijah Doty and Arthur Yates. 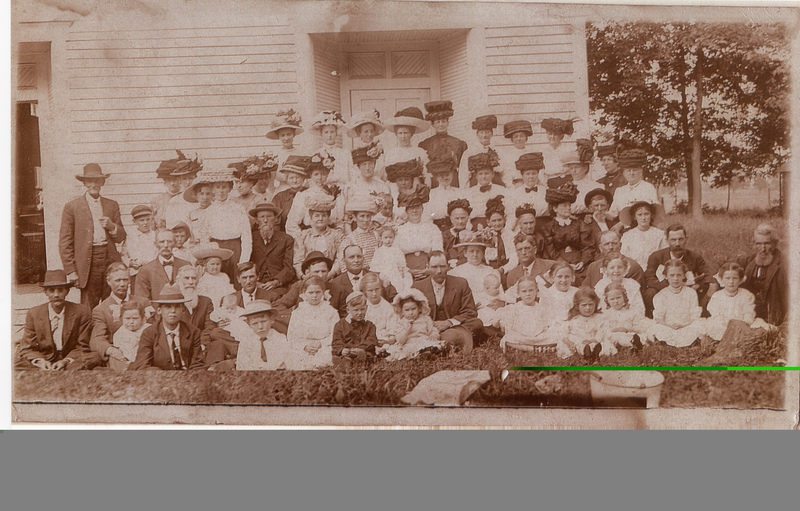 Front Row: Aunt Docia Williams, Elder Elijah Doty (pastor), Albert Givens family - Marjory, Jim, Mable & Baby (Ellen), Bill and Jr, William Moran, and Albert Givens. 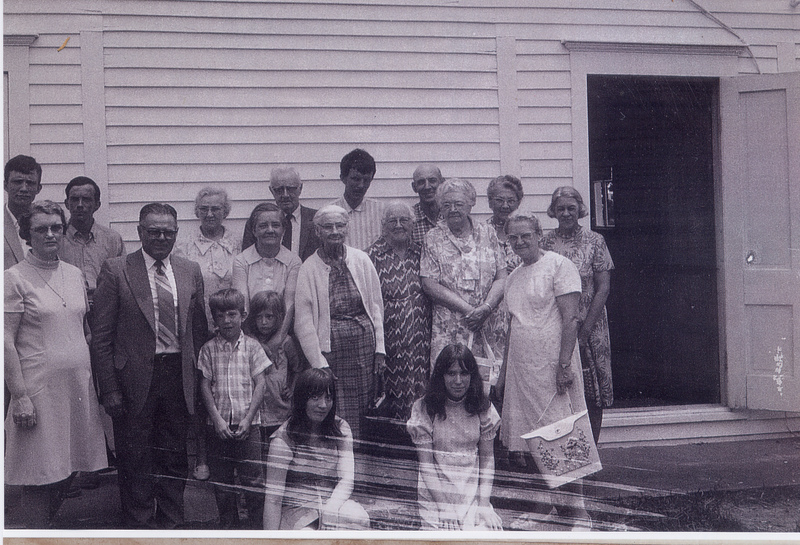 Second Row: Laura Young, Sister Eagan, Nanny Jacob, Tildia Givens, Hattie Lowden, Art Young. Third Row: Bro. and Sis. Luther Beard, Bro. Eagan, Arthur Yates. Fourth Row: Ike and Hallie (Smith) Montgomery, Bertha Weidner, Brother and Sister Dalton Vandeveer, Paul Jones. 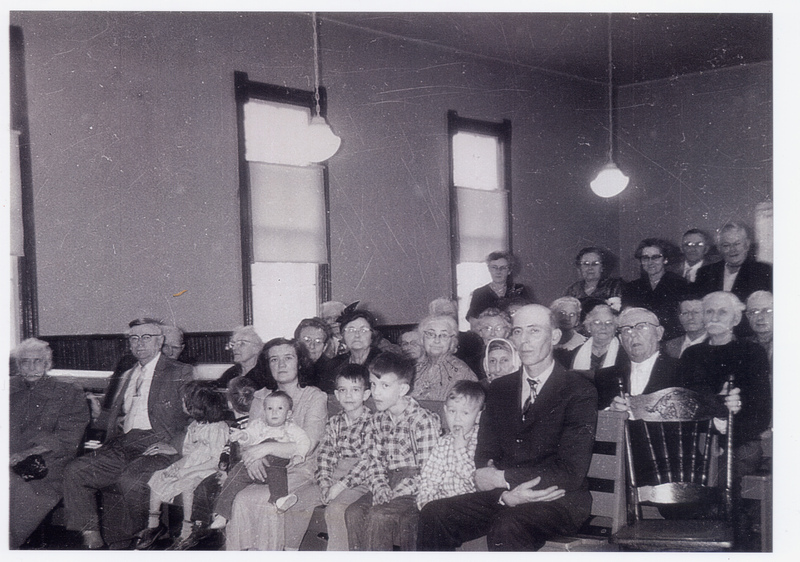 Fifth Row: Mary Jones, Eula Beard, Bart Bennett and wife, Archie Beard, and Vida Williams. 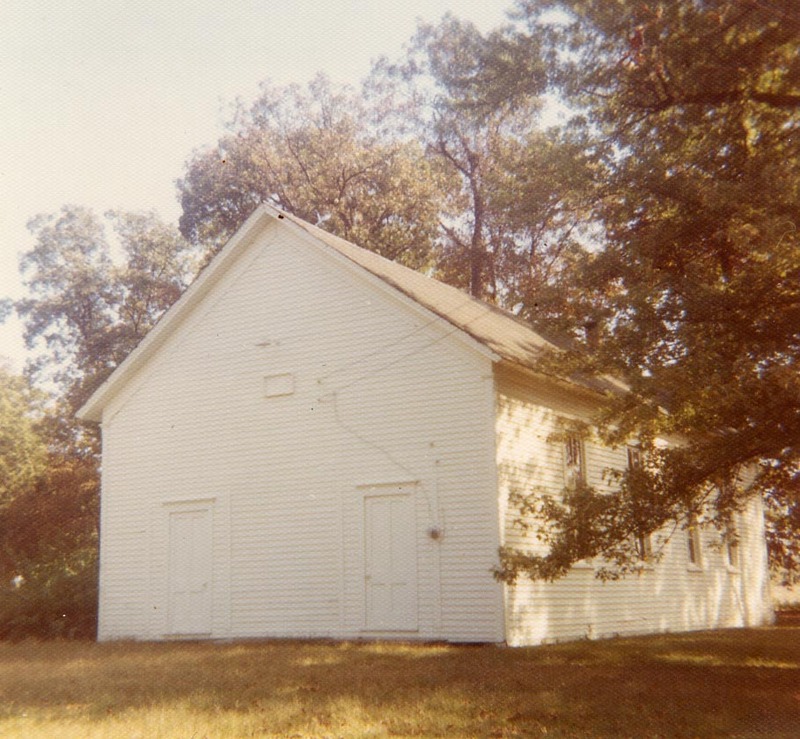 Condition of the church building in the 1970's, newly painted. The old building was beyond repair. 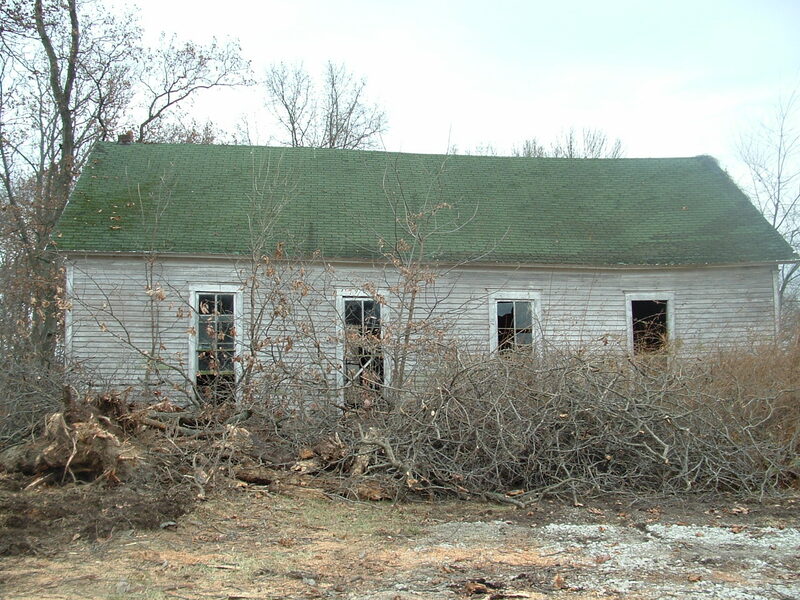 It was demolished and burned on December 3, 2010. Broken trees, and trees too close to the new building site have also been removed and burned. Additional landscaping and brush clearing was done late in 2011, and more remains to be done. An addition has been made to the cement block building for use as a storage building. A new church sign was installed on November 29, 2010. Copyright c. 2010-2019. The Primitive Baptist Library. All rights reserved.